Frank Emmett has spent the last five years at The Ecumenical Center, but he’s spent most of his life helping people discover the power, joy and goodness within themselves. 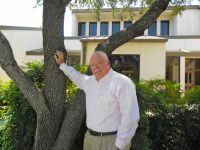 With bachelor and master’s degrees from Trinity University and a Ph.D. from Texas Tech, Frank pursued a career in mental health for the military – including 3 years with US Army Mental Health and 18 years in practice for the USAF – and retired from the air force as a Lieutenant Colonel. It’s no surprise, then, that much of his work at The Center is with veterans. Or that one of his clinical specialties is EMDR (eye movement desensitization & reprocessing), a treatment technique that has proven helpful in PTSD cases. However, he’s also known for his expertise in several other mental health areas, ranging from psychological testing and assessment to ADHD treatment to suicide prevention. What many people may not know is Frank’s love of world travel, his in-depth study of UFO phenomena, and his reputation as a historian of USAAF aviation in the Pacific during WWII. He even builds aircraft models for museums! Share the post "Meet Frank Emmett, Ph.D., USAF Lt. Col. (Ret.)"